Using charcoal is the traditional form of infrared grilling that we're all familiar with: glowing briquettes emit direct heat through infrared energy into the food being grilled, giving that mouth-watering smoky aroma and delicious crust. With the SIZZLE ZONE infrared burners from Napoleon®, you get these benefits plus convenient gas technology: each burner contains thousands of gas outlets that heat the ceramic surface until it starts to glow red. The resulting infrared rays don't just warm the ambient air; the heat penetrates directly and deeply into the food. It also creates a consistent thermal area that, compared with a charcoal fire, is much easier to control. Napoleon® infrared burners produce extremely high temperatures, making them ideal for the preparation of juicy steaks, burgers and other meats. The SIZZLE ZONE can also be used as a side burner, and combined with a ceramic heat plate provides the perfect way to prepare delicious stir fries in a wok. The dual-level sear plates allow for consistent circulation of heat to the cooking grids, preventing the occurrence of "hotspots". It's not just the staggered height of the plates that makes them effective; it's also their rising position from back to front, which allows naturally hotter air at the back to move to the front where it's cooler. they channel any dripping fat or juices away from the flames, making barbecuing safer and giving your food a better, more intense flavour. Igniting a Napoleon® gas burner is made easy by Napoleon‘s unique innovative JETFIRETM ignition system which ignites each individual burner with a strong burst of flame from a separate gas outlet. This allows for the burners to ignite even in extreme weather – the dreaded click of a failed Piezo ignition is a thing of the past. This innovative technology is only used in this way in Napoleon® BBQs. a Napoleon® BBQ. But the wave shape doesn't just give your food an appetising appearance, it also has practical benefits: the wavy cooking grid promotes more evenly distributed heat and also makes it much harder for small bits of food to fall through. Once again, it is the small details that make a Napoleon® BBQ a Napoleon® BBQ. Both the JETFIRE ignition system and the WAVE cooking grids come as standard with all our gas BBQs. The dual-level sear plates are also standard with all gas BBQs except the Triumph®, LE/LEX and TravelQ series. Napoleon Gas BBQs There are 8 products. Napoleon Rogue BBQs... The new way to barbecue. Rogue. Get out there and go Rogue on your next meal. With affordable options and high quality standards, you can afford to grill different with the Rogue Gas BBQ by Napoleon. The Napoleon Rogue® series combines innovative features, comprehensive functionality and refined design. 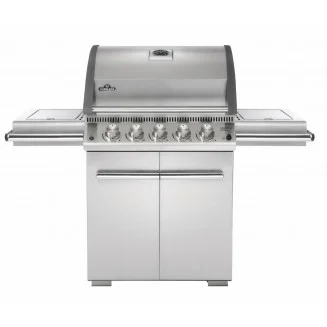 Quality gas BBQs in the Rogue® series boast a broad spectrum of applications, for example, the R365SIB and R425SIB are industry leading with their stainless steel cooking grids and Napoelon’s unique SIZZLE ZONE side burners. The range side burner on the R425SB can be used for pans and other accessories to cook your side dishes and sauces while the main meal is prepared on the cast iron cooking grids in the spacious grill head. Napoleon LE BBQs... First-Class Features. Affordable Prices. The LE series from Napoleon® provides barbecuing delights for all tastes. Napoleon’s infrared SIZZLE ZONE creates a unique steakhouse tasting experience. The ceramic rear burner allows for BBQ specialities from the optional rotisserie kit, while the integrated cutting board and ice/marinade bucket take their place in the left shelf and offer convenient additional features. Napoleon LEX BBQs... 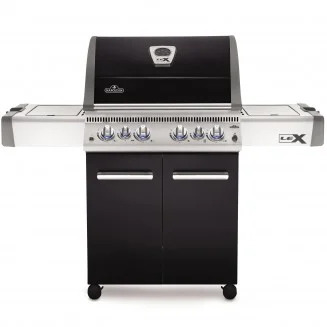 High-end stainless steel grills for an affordable price, Napoleon’s LEX Series gas grills are an entire outdoor kitchen in one affordable cabinet. The gourmet Napoleon LEX series BBQs are almost too good to be true: high-quality stainless steel models at affordable prices combine all the functionality of an outdoor kitchen in just one appliance. Backlit control knobs allow for enlightened barbecuing delights well into the night, while the legendary SIZZLE ZONE (to the side on the LEX 485 or within the grill head on the LEX 605 and LEX 730) allows you to grill the perfect tasting steak. 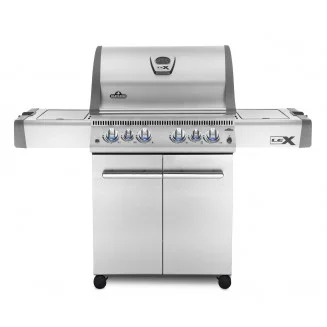 The range of equipment is so comprehensive that the LEX BBQs are among the best in their class. The stainless steel finish means a long lifespan and many hours spent with friends around the BBQ. Napoleon Prestige BBQs... Practical. Premium. Prestige. High-quality workmanship and equipment are the key features of the Napoleon Prestige® series. The solid stainless steel design offers its owners not just a BBQ that has been built to last, but one that is very appealing to the eye. However, the real value of the Prestige® series goes beyond looks: the SIZZLE ZONE infrared side burner and the infrared rear burner make for a special kind of barbecuing experience. The four large main burners, combined with the super- effective stainless steel sear plates, offer maximum flexibility and ef ciency for all kinds of BBQ recipes. Napoleon Prestige Pro BBQs... The Ultimate in grilling. Sophisticated technology and the perfect design are key features of the Prestige PRO series, with its chrome accents and quality stainless steel construction emphasising the BBQ’s elegant appearance. Yet the Napoleon® Prestige PRO BBQ isn’t just good to look at: treat your guests to the perfect steak grilled on the Prestige PRO, or create delicious meals using the optional rotisserie kit. In other words, the Prestige PRO series provides the ultimate barbecuing experience. Napoleon Portable BBQs... Barbecuing fun on the go! Genuine, infinite freedom: with the TravelQ series BBQs, you can enjoy barbecued food wherever you like! All TravelQ models have the WAVE cooking grids in porcelainised cast iron, which ensures the sustained, even distribution of heat. Convenient handling, sophisticated transport solutions and efficient barbecuing performance set new standards, meaning your portable gas BBQ will become a reliable partner for every adventure. 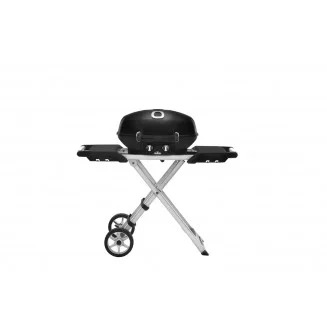 Napoleon LE3 BBQ - Stainless Steel with Infrared Rear & Side Burners is made from high quality stainless steel, this grill isn’t only shiny but it’s built to last. Get the whole package with five stainless steel burners, an infrared rear burner for rotissing food – and you can even sear over high heat with the infrared side burner. Napoleon LEX 485 BBQ - Black with Rear and Side Infrared Burners (LEX485RSIB-1) is made with durable black finish to look good while shrugging off even the harshest weather. They have everything needed to create delicious meals with a creative flare. Ample storage provides the perfect place to tuck your favorite grilling accessories. 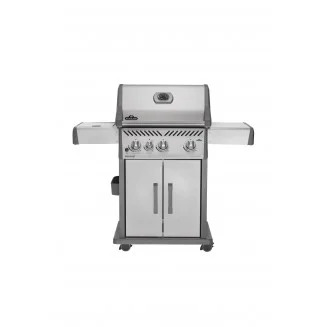 Napoleon LEX 485 BBQ - Stainless Steel with Rear and Side Infrared Burners (LEX485RSIB-1) is made with durable stainless steel to look good while shrugging off even the harshest weather. They have everything needed to create delicious meals with a creative flare. Ample storage provides the perfect place to tuck your favorite grilling accessories. 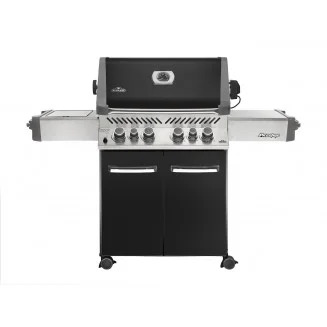 Napoleon Prestige 500 BBQ Black with Infrared Side / Rear Burners is the total package. A cart model grill by Napoleon with the capabilities of a full outdoor kitchen. The P500RSIB has 4 main burners, 1 infrared rear burner and 1 infrared side burner. This gives the P500RSIB the capacity to cook in at least 8 different ways. 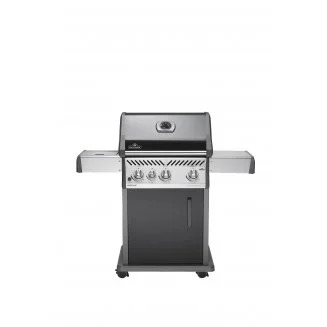 Napoleon Rogue 425 BBQ - Stainless Steel with Infrared Side Burner prides itself on taking your grilling experience to the next level and the Rogue Series R425SIBPSS Gas Grill is the perfect way to make your (sear) mark while cooking. Napoleon Rogue 425 SBR BBQ - Black with Range Side Burner - It’s time to break free from boring backyard grilling with the Napoleon Rogue 425 with side burner in black. It’s time to be different. It’s time to grill different. It is time to go Rogue.